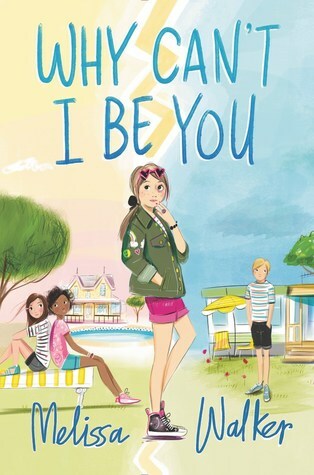 Like last year's Let's Pretend We Never Met, Why Can't I Be You is another strong and engaging middle grade friendship story from Melissa Walker. Claire and Ronan, who live in the same trailer park, have been friends for a long time, but this summer things feel different. Ronan's dad, who has been away from the family for a while, has now returned, but his mental health is questionable. Claire's other good friend, Breanna, has recently moved to a fancy big house with a pool and other amenities of which Claire can only dream, and she has started hanging around with her cousin, Eden, who acts much more sophisticated than Breanna despite being only one year older. Claire is worried about Ronan, jealous of Breanna and both irritated and fascinated by Eden, and she finds herself feeling more and more isolated as the summer wears on, leading her to question whether it might be easier to be someone else. As the title suggests, this book focuses a lot on the idea that "the grass is always greener on the other side." Each of the characters sees something desirable in another character's life. Claire longs for Breanna's material goods, while Ronan wishes his dad was more like Claire's. Claire wonders if boys will ever look at her the way they look at Eden, and Breanna longs for the simplicity of her former life, when wealth didn't dictate her family's every move. While the characters each grapple with their desires to be someone else, they miss opportunities to show empathy toward one another and to support each other as friends during their times of difficulty. In middle school, kids often feel as though the events of their lives are completely unique to them, and that everyone around them is perfectly happy and well-adjusted. I appreciate that this book shows that every kid has something that makes them insecure and that recognizing that and seeking to help each other through it is the best way to handle it. I also thought it was interesting to explore how changes in socioeconomic status can affect friendships at this age. So many middle grade friendship stories exist in a vague middle class universe where the characters seem to have whatever material objects the plot deems necessary. This book felt a little more real because the characters did feel the limitations of their financial situations. It was also nice not to have the novel consumed by a lot of romance. Eden is the only character who seems really interested in dating, and Claire finds this puzzling. Often boy/girl best friendships in books like this devolve into ill-fated dating relationships; the friendship at the heart of this book felt all the more believable because that doesn't happen.